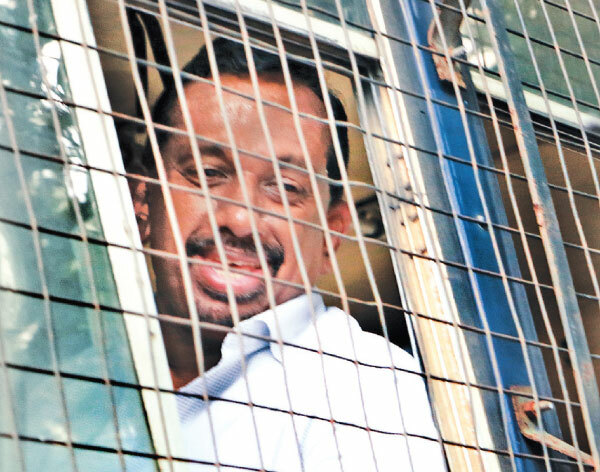 Former Sports Minister and Joint Opposition (JO) MP Mahindananda Aluthgamage who was arrested yesterday by the Financial Crimes Investigation Division (FCID) and produced before the Colombo Fort Magistrate, was ordered to be released on cash bail of Rs. 35,000 and two sureties of Rs.500,000 each. Aluthgamage’s passport was also impounded. The next court date was fixed for May 11, Police Media Spokesman SP Ruwan Gunasekara told the Daily News. Aluthgamage was arrested when he arrived at the FCID to record a statement based on the allegations of misusing state funds. The former Minister was summoned by the FCID pertaining to investigations that are currently being carried out by the FCID in connection with the alleged misappropriation of Rs 39 million for the purchase of carrom and checkers boards to Sathosa in 2014. Addressing the media gathered outside the FCID, Aluthgamage said, “If the government thinks they can put us behind bars and stop us going against them, they are sadly mistaken. “I have brought my clothes with me, as I know they will charge me under the Public Property Act and deny me bail. The government is willing to do anything to stop us. I have no sadness but I we are ready to face any situation,” Aluthgamage said. Aluthgamage is facing allegations of having distributed of equipment worth around Rs.39 million to selected school and sports clubs for political purposes during the period he was the Sports Minister. Meanwhile, Aluthgamage had previously filed a special appeal petition to the Supreme Court seeking an order to prevent the FCID from arresting him. However, it was rejected by the Supreme Court without being taken up for hearing. With regard to the same allegation of misappropriation of funds during the purchase of sports gear, the former Chairman of Sathosa, Nalin Ruwanjeewa Fernando, was arrested and remanded. But, later, he was granted bail on April 10. MP Mahindananda Aluthgamage who was granted bail yesterday, was again ordered to be remanded until today, due to his failure to meet the bail conditions imposed by the Colombo Magistrate’s Court. He had failed to produce a copy of his passport to the Court Registrar on time to process his release. Aluthgamage’s passport is impounded by the Colombo High Court.